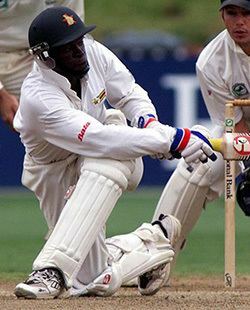 Trevor Nyasha Madondo (November 22, 1976, Mount Darwin, Mashonaland – June 11, 2001, Parirenyatwa Hospital, Harare) was a Zimbabwean cricketer who played in 3 Tests and 13 ODIs from 1998 to 2001. Growing up, Madondo attended Lilfordia School and Falcon College. At Falcon. he also played hockey and rugby union. He gave up his studies at Rhodes University to become a full-time cricketer. A middle-order batsman, he hit his highest first-class score in his last Test when he scored 74 not out against New Zealand in 2000-01. He died a few months later at the age of 24 from malaria. He is the fifth-youngest Test player to die. As of 2013 he is the only deceased Zimbabwean Test cricketer. In November 2008, his brother Tafadzwa Madondo died in a motorbike accident while vacationing in Bali.